--Welcome to the newest member of our sales team, Cody Nierstedt! Cody is a guitar expert with a music degree from Adelphi University and several years of performance experience. I'm super excited to have him join us! --Welcome, also, to our new woodwind instructor, Dr. Anthony Ciccone. Anthony is an experienced educator and performer with several degrees in education and performance from Rutgers and New York Universities. Look for his profile on our educator page, coming soon! --We're moving! It's official--we have outgrown our little store. This Spring, we'll be moving to our new location in the Toms River Center plaza on Route 37, across the street from Shop-Rite, about a mile south of where we are now. We'll have more floor space, two more lesson studios, and a waiting area for parents of our lesson students to relax in, as well as an updated look. Check back here for more details as they come! --It's Horns of Plenty time again! Are you or your child ready to upgrade from that student model instrument? 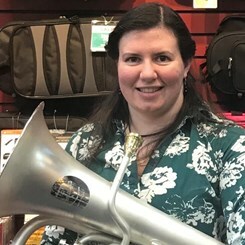 If you've been playing for more than a year or so and plan to continue, this will be the perfect opportunity to find the perfect horn. Look for the Horns of Plenty event post for the details!